Accidental fires continue to remain a serious safety threat to homeowners, renters, and their families. According to recent statistics, roughly 3,400 people are killed in home fires each year, making them the third most common cause of accidental deaths in the home. At Midwest Restoration, we’ve helped hundreds of homeowners across Illinois, Southwest Wisconsin, and Northwest Indiana restore their home and property after the devastating effects of a house fire. If you need restoration assistance after a fire, flood, or disaster, contact our experts right away. 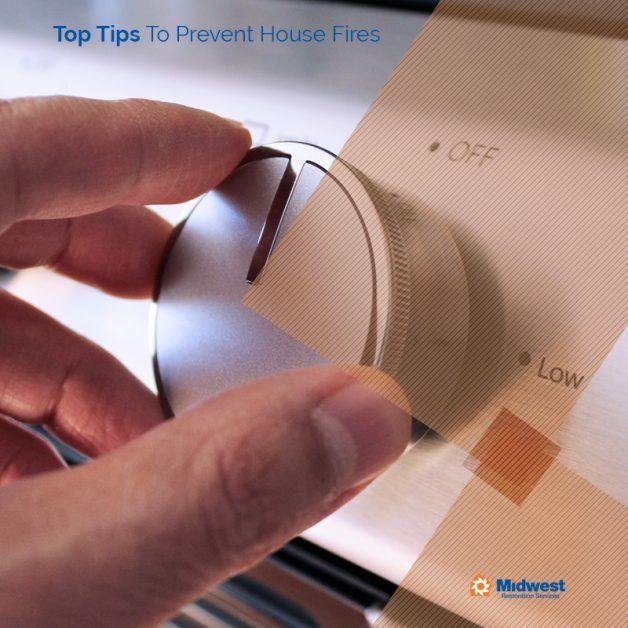 In this article, we’ll discuss some top tips to prevent house fires. Most house fires start in the kitchen, with stove-top cooking representing the leading cause of home fires. Many of these accidental fires occur when residents put something on the stove, only to become distracted and walk away. A great way to avoid this is to always stand near the cooking pan. Regardless of what you’ve got cooking on the stove, it’s critical to give it your undivided attention, so you don’t forget about it. Another common cause of household fires in Illinois is frayed or damaged electrical cords. Take the time to inspect all of the wiring throughout your house. This can include TV wiring, internet cables, video gaming systems, and much more. If you notice that any electrical wiring is damaged, make sure to replace it right away. It’s also important to make sure that your electrical cords aren’t being pinched by large items such as rugs or furniture. Did you know that smoking is the third most common cause of home fires and the top cause of home fire deaths? If you’ve become accustomed to smoking inside of your home, our restoration experts strongly advise against it. Many house fires occur when smokers lose track of their still-smoldering butts. All it takes is a flammable surface, like a couch or basket of laundry, to set off a destructive house fire. If you’re a smoker or you have a smoker in the house, the best way to prevent cigarette-related home fires is to keep the smoking outdoors. For extra safety, douse your butts in water before you throw them away to make sure they have been completely extinguished. Midwest Restoration is proud to be a leading provider of fire restoration services throughout Illinois, Southwest Wisconsin, and Northwest Indiana. Contact us today!